Mickey’s Sail-A-Wave! 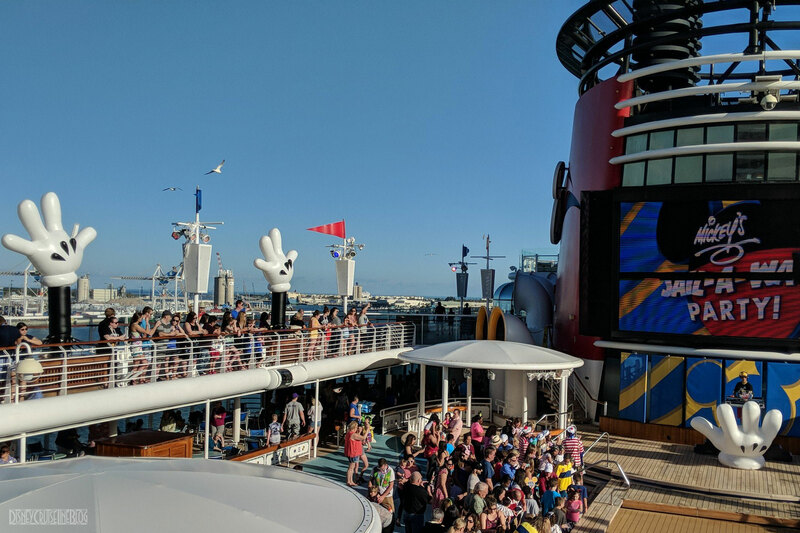 Family Deck Party is in full swing wave aboard the Disney Wonder following the show’s official debut during the February 3rd repositioning cruise from San Juan to Port Canaveral. Little was know about the show when guest started to receive emails from Disney Cruise Line in late January. According the the Personal Navigator, Mickey’s Sail-A-Wave Party! is the all new sail away family deck party on deck 9. This high energy, Disney Bounding, countdown celebration lets guests wave goodbye to work & school, and hello to vacation! I will save everyone the worry, Mickey and the gang are on hand to throw a sail-a-wave celebration you won’t forget. Disney Cruise Line encourages guests to bring their own Mickey gloves (or purchase them onboard or prior to the party) so you can wave them in the air as you dance to your heart’s content. There will also be an opportunity to decorate paper glove in the youth club during open house. My good friend Eric was aboard today’s cruise and shared the following video of Mickey’s Sail A Wave! Family Deck Party. The new, high-energy Mickey’s Sail-A-Wave Party! features the latest dance mixes and current favorite music, with 2 great hosts and a terrific DJ leading the way. Be awestruck by the last surprise-filled minutes of the show. Then feel the excitement surge when the Cruise Director leads the countdown to the horn blast—and your ship pulls away from the port! When Mickey’s Sail-A-Wave Party! is in full swing, the excitement is captured by concert video cameras that project images of Guests dancing it out—you might even see yourself on the big screen! A giant inflatable Mickey glove onstage surrounds the DJ, creating a designated location on the pool deck so a runway performance can bring the action and the cast into the middle of the audience. As confetti and streamers rocket through the air, celebrate this magical introduction to your vacation at Mickey’s Sail-A-Wave Party! The Adventures Away! Deck Party aboard the Disney Magic will soon change over to the Mickey’s Sail-A-Wave Party on the February 22nd 5-Night Bahamian Cruise from Miami with Marvel Day at Sea. DCL is also referring to the deck party as Mickey’s Sail-A-Wave Party!… A Bon Voyage Celebration. What do you think of Mickey’s Sail A Wave! Family Deck Party? Let us know in the comments below. The post Video: Mickey’s Sail-A-Wave! 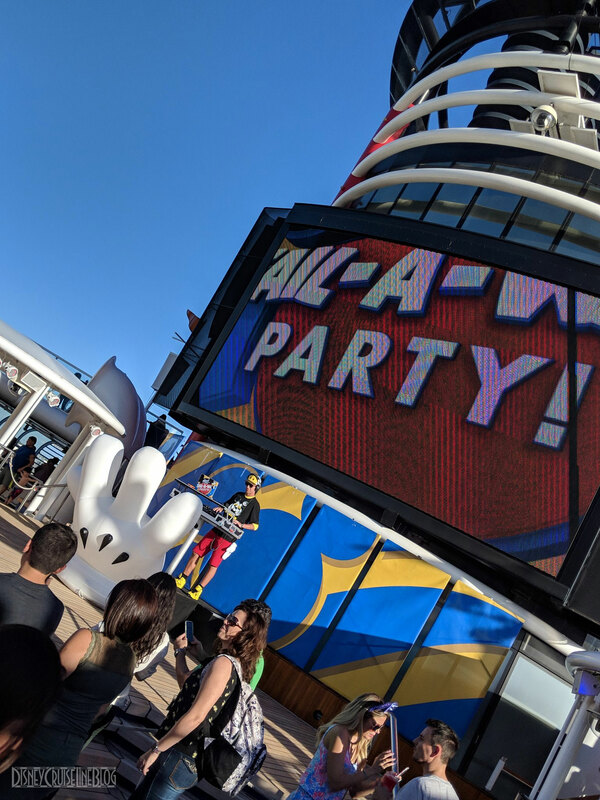 Family Deck Party – Disney Wonder appeared first on The Disney Cruise Line Blog.